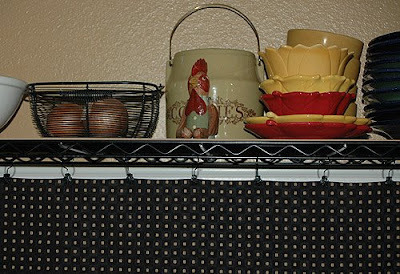 I made this skirt today to go around this old shelving unit - it hides the ugly dog food and telephone books. Happy, even though it's just a "making-do" kind of thing - I have not been able to find a tiny little hutch to fit the spot yet, not that I spent all that much time looking before I gave up. 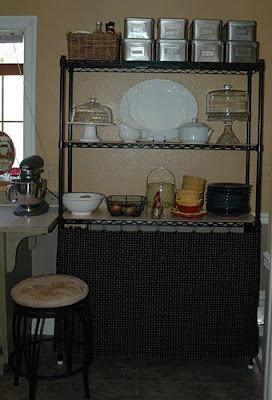 Try a baker's rack, we got one as part of a kitchen dining set that works great. It's only about 16" deep on the lower half, so it fits well in tight spaces. We use ours as sort of a message center since it is right by the back door. That's a great solution. There's nothing wrong with Making Do until the right thing comes along. I like it! Looks like the bookshelves in my office (I needed massive storage). Love this idea!! The skirt just makes it.